The 2017 IAAF World Indoor Athletics Tour came to a very exciting end today at Birmingham’s Barclaycard Arena with the Müller Indoor Grand Prix which had a ton of stellar performances. The distance portion of the meet was highlighted by a European record in the 5000m by Mo Farah, a European record in the 1000m by Laura Muir, a Kenyan record by Hellen Obiri in the 3000m, and two wins and world leaders by Americans Cas Loxsom and Ben Blankenship in the 800m and 15000m respectively. In the sprints, double Olympic Champ Elaine Thompson lived up to her billing running 6.98, the fastest time in the world since 2014 and Andrew Pozzi ran a world leader in the 60 hurdles. A full recap meet recap appears below starting with the distances and the European records. Full results on one page can be found here. In what was billed as the final indoor race of his career, Mo Farah went out in style as he held off a challenge from Bahrain’s Albert Rop and got the European record by running 13:09.16 – the first sub-13:10 indoors in European history (Farah had run 13:10.60 in 2011, but that was for some reason never ratified as the European record). The first 1600 was covered in 4:12.05 then Farah took over the lead at 1800, which he maintained for 1k. 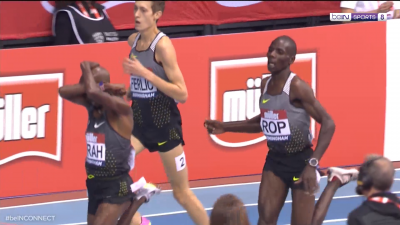 Just after 3k (7:56 for Farah), Rop took the lead as they hit 3200 in 8:28.63. Just before 400 to go (12:12), Farah went back into the lead and he’d never give it up. Rop challenged Farah many times on the way home – first on the home straight of penultimate lap and then again on the backstretch of the last lap – but Farah held him off each and every time. But Farah was working hard as he was looking over his shoulder on the final turn to make sure he had it. Farah said this was his last indoor track race of his career and the plan is to end his career on the track at the World Championships in London this summer before the home crowd. After completing his Olympic double-double in Rio last year, Farah started 2017 with a whimper, only finishing 7th at the Great Edinburgh XC race in January. After Edinburgh, he realized he had a lot of work to do so he packed his bags and headed to his training camp in Ethiopia. “I knew from Edinburgh five weeks back I needed to do some work. I had to go away and leave my family behind and go back to real training… It’s paying off,” he said on the BBC broadcast today after his record run. It’s hard to believe Farah’s track career is really coming to an end in 2017 as he’s still the best in the world, but Steve Cram noted on the broadcast that if Worlds weren’t in London this year, it’s likely Farah’s track career would have ended in Rio with his double Olympic wins. In yet another sensational run, Brit Laura Muir got the British (Kelly Holmes‘ 2:32.96) and European 1000 record and put a scare into the world record (Maria Mutola‘s 2:30.94) by running 2:31.93 to win the women’s 1000. The pace was a little slow the first lap (30.30) but Muir was right on rabbit Jenny Meadows’ heels and the pace increased as they hit 400 in 59.65 and 600 in 1:29.71. The record attempt was most definitely on. 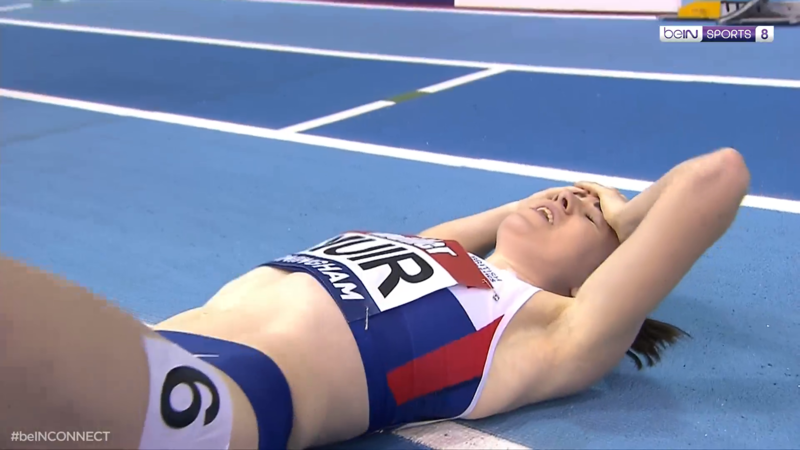 American Olympic 800m finalist Kate Grace had tried to keep it close, but Muir was now free and racing the clock. At 800 (2:00.56) it appeared the world record was slipping away but Muir dug deep all the way home and was rewarded with a new British mark and became the #2 performer all-time indoors. Behind Muir, Grace’s early ambition cost her as she faded and came up short of Jen Toomey’s 2:34.97 American record by running 2:36.97. Well when Muir races, she’s definitely bleeding and totally going for it. It’s really quite inspirational to watch. She’s totally spent at the end. In today’s race, she nearly broke her 800 pb (2:00.42; her 800 split was 2:00.56) and still had another lap to run. Great stuff. Last year at the Olympics, she went for the win and it cost her a medal. This year that aggressive running has rewarded her with the European 1000m and 3000m records. One week ago, Loxsom looked out of place running the 1000m at the Millrose Games. But he closed quickly in that race to move up for second over the final 200, and he shined today in an event he’s far more comfortable in, the 800. Loxsom got out well and stuck right on rabbit Bram Som, who took him through 400 in 50.28. By the time Som dropped out at 500, Loxsom had opened up a big gap on the field and at the bell (1:17.50), he had a lead of approximately 15 meters. The rest of the field, led by 2015 world bronze medallist Amel Tuka, was closing hard as Loxsom was starting to tie up. But he dug deep and managed to hold on, and was rewarded for his aggressive running with a world leader of 1:46.13. Tuka wound up second in 1:46.59, a Bosnian national record, while American Erik Sowinski finished fourth in 1:46.85. This was already the case, as Loxsom won the 600 the last time it was held at USAs in 2015, and earlier this year set a world record in the event (1:14.91). But if there was any doubt, he removed it today with a strong run from the front. Loxsom has the speed to get to the lead early and the strength to hold on to it late. He will be tough to beat in Albuquerque. Can he take things to a new level outdoors at the 800 this year? So he’s run four races, all within .11 of each other. That seems hard to imagine, but Sowinski did something similar in 2016 — apart from his World Indoor semi, his seven other races last year were all between 1:47.11 and 1:47.62. 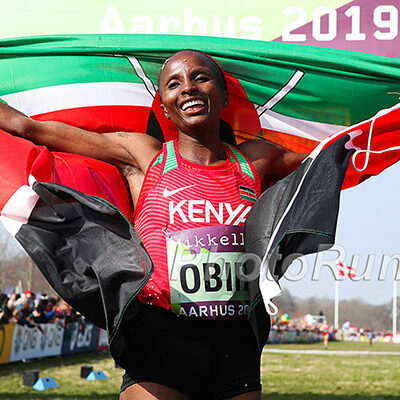 Very little happened until the rabbit dropped out after one kilometer (2:25.62) as for the first five laps, the order of the top four remained unchanged: Kenyans Vincent Kibet, Bethwell Birgen and Hillary Ngetich, followed by American Ben Blankenship. Blankenship was the first to shake things up as he made a hard move to the lead just before 400 to go, but Birgen answered quickly and passed Blankenship to assume control on the backstretch. Birgen was kicking hard, but he may have not known where the finish was, as Blankenship had no problem blowing by him coming out of the first turn of the bell lap. Aussie Ryan Gregson went by as well, and as they rounded the final turn, Gregson ducked inside looking for room to pass. But Blankenship had it blocked, forcing Gregson to go for the outside pass on the homestretch. He couldn’t quite get around, however, as Blankenship held on for the win and a new world leader in 3:36.42. Gregson’s efforts were rewarded with an Australian national record of 3:36.50. 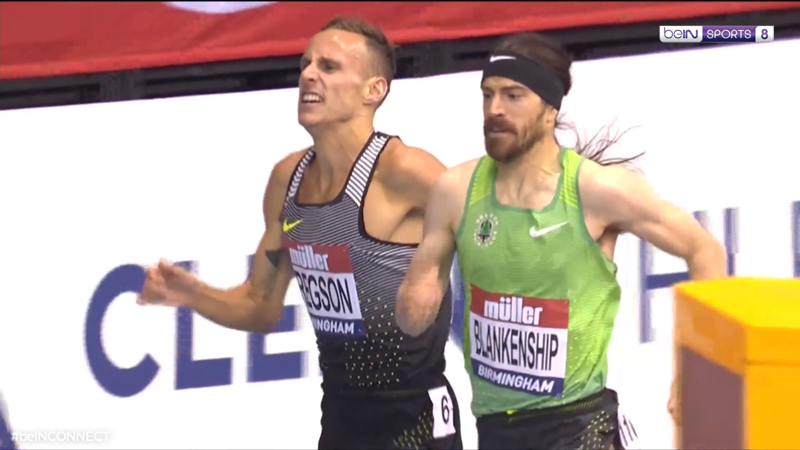 Blankenship struggled in his 2017 opener last week at Millrose, taking ninth in the two-mile in 8:27.10, but he looked much better today in his specialty. One of Blankenship’s underrated skills is his tactical ability — in particular, his anchor run in the DMR at the 2015 World Relays comes to mind — and he did an outstanding job in that respect today, measuring his energy well and closing off the inside of lane one once he got to the lead, preventing Gregson from stealing the win. Because of Australia’s remote location, athletes from that country have to travel a lot for high-level competition, and Gregson’s last two years are evidence of this point. In 2016, Gregson raced in 14 countries on four continents. And in the last 10 days, Gregson won two miles at the Nitro Athletics series in Melbourne, won a mile in Athlone, Ireland, in 3:56.49 and set an Australian national record today at 1500 meters. To run that well after traveling so much is very impressive. 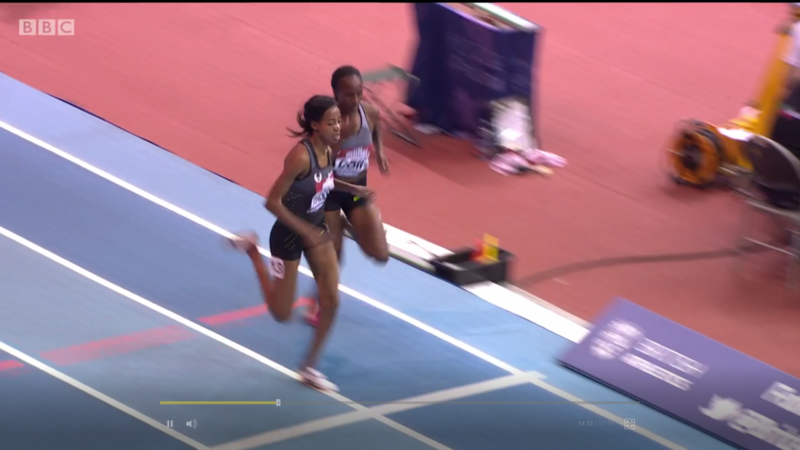 We fully expected to see this one come down to a battle between Sifan Hassan and Hellen Obiri and that’s what happened. The big surprise was that American Shannon Rowbury was a non-factor. The pace was honest from the gun as they hit 1k in 2:51, 1500 in about 4:17-18 (the race was already down to Obiri and Hassan at that point) and 2k in 5:42. Obiri, who ran a Kenyan national record of 8:29.46 in Germany two weeks ago in losing to Laura Muir, was doing all of the work and driving the pace as Hassan sat on her until just before the bell, when Hassan went to the lead. 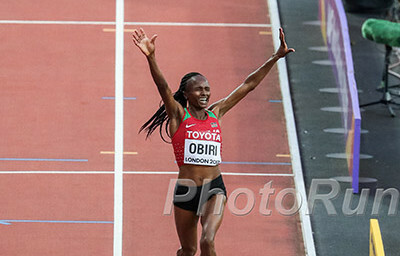 However, Obiri came back on her on the backstretch and pulled away to earn a much deserved victory and new Kenyan indoor record of 8:29.41 (29.91 last lap) as Hassan set a new Netherlands national record of 8:30.76 in second, breaking the long-standing record of 8:33.82 that Elly van Hulst ran to win World Indoors in 1989 – which at the time was a world record. 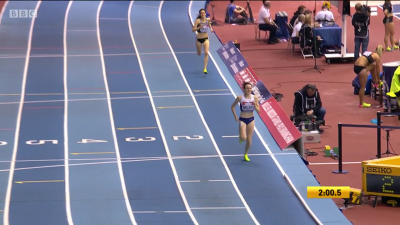 Behind them, there was a battle for first non-African-born honors and it surprisingly went to Eilish McColgan, who ran a big indoor pb 8:43.42 for 5th (previous pb of 8:49.31, her outdoor pb is 8:43.27) as Rowbury, who ran 8:41.94 in Boston, only managed 8:45.84. 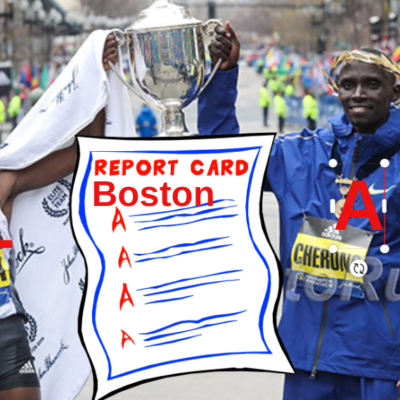 Though she did not win, Hassan looked stronger than she did when she raced Obiri in Boston three weeks ago, and there’s no shame in running 8:30 and losing to a stud like Obiri. 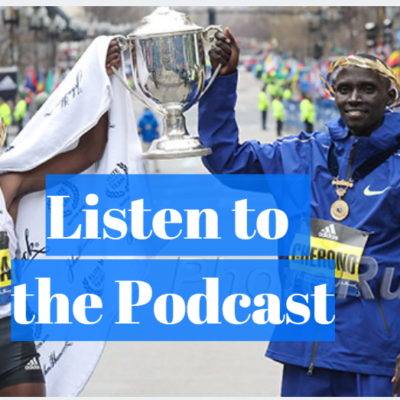 Hassan’s coach Alberto Salazar told the Oregonian’s Ken Goe this week that Hassan is still “in the beginning stages” after recovering from a hamstring injury that led to an unorthodox stride. That’s scary because 8:30 is moving, indoors or outdoors. 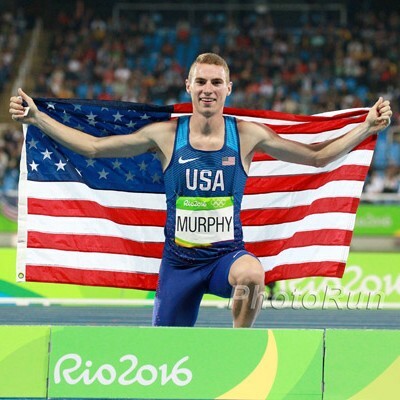 Goe also revealed in that story that Nike Oregon Project assistant coach Pete Julian is now serving as Rowbury’s lead coach. 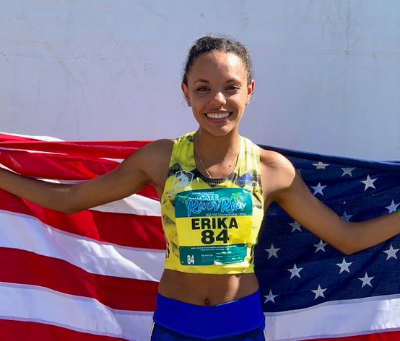 Rowbury will be disappointed with her result today — she was one of just two athletes in the 14-person field not to PR — but her 8:45.48 was still over five seconds faster than any other American has run this year and she remains the favorite in the 2-mile at USAs in two weeks. That being said, we wonder if having one of your rivals – particularly one that is seven years younger – in your own training group will be hard for Rowbury to handle. Adding Mo Farah to Galen Rupp’s group worked wonders for both guys initially but soon they largely stopped training together. The battle between the fourth and fifth placers at the Rio Olympics proved to be no contest as Poland’s Joanna Jóźwik, who had already won the $20,000 series title before the race even was run, cruised to her fourth straight victory this winter in 2:01.12. The pace was never that fast as Bishop had the lead at 400 (59ish) once the rabbit dropped out. She hit 600 in 1:30.86 and then Jóźwik bolted to the lead and never looked back. Bishop faded badly over the final lap to fourth (2:02.19). 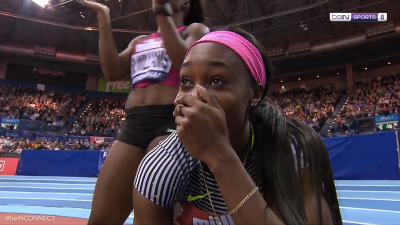 US Olympian Chrishuna Williams’ first crack at an 800 this year (she’d run 52.02 for 400 last week) didn’t go well as she was last in 2:05.32. Thompson, the 100/200 Olympic champ, easily won her heat in 7.22 and looked set for something fast in the final. She delivered by storming out of the blocks and winning in a rout in 6.98, the world’s first sub-7.00 clocking since 2014. Thompson is still only 24, and we can’t wait to see what she’ll do this summer if she’s running this fast already. Thompson’s fellow Jamaican Gayon Evans earned the World Indoor Tour title and a bye to World Indoors by finishing second. Hungary’s World Indoor silver medallist Anita Marton got the win and the IAAF World Indoor Tour title by throwing 18.97m, the second-longest throw in the world this year. A Bermudian national record by Tyrone Smith (7.83m) was not enough to stop 2008 World Indoor champ Godfrey Mokoena of South Africa, who won with a leap of 7.99m. Olympic champ Katerina Stefanidi of Greece followed up her Millrose win with another victory in Birmingham as she was the only woman to clear 4.63m. Switzerland’s Nicole Buchler took second, which was good enough to secure her the World Indoor Tour title and it’s $20,000 bonus. 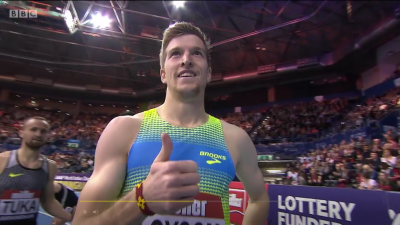 Two-time World Indoor champ Pavel Maslak of the Czech Republic continued his mastery of the boards, winning in 45.89 over 2012 Olympic silver medallist Luguelin Santos of the Dominican Republic. Maslak also clinched the World Indoor Tour. The Bahamas’ Donald Thomas already had the World Indoor Tour victory in hand, but he only finished sixth here as two-time American Olympian Erik Kynard got the win with a 2.31m clearance. World Indoor bronze medallist Lorraine Ugen followed up her win at the British Championships with another victory on home soil, leaping 6.76m. World 400 hurdles champ Zuzana Hejnova of the Czech Republic came on late to win this race in 51.76. Brit Andrew Pozzi continued his banner year, setting a new personal best and world leader of 7.43. The U.S.’s Christina Manning followed up her midweek victory in Athlone with another one today in Birmingham, cruising to the win in 7.83 seconds. Ronnie Baker of the U.S. entered as the world leader and didn’t disappoint, clocking 6.55 for the victory. 40-year-old Kim Collins won a tight four-way battle for second in 6.58. Full results on one page here.